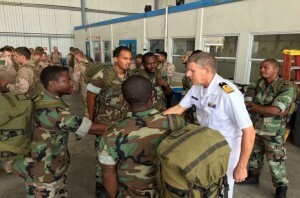 WILLEMSTAD - Dutch and Curaçao members of the Dutch military stationed in Curaçao returned to Curaçao from St. Maarten on Tuesday. Commander of the Navy in the Caribbean Brigadier Peter Jan de Vin was at Hato Coast Guard Support Centre to welcome them. This group was sent to St. Maarten immediately after the passage of Hurricane Irma. They have supported local authorities with maintaining public order, security at the airport and playing an active role in distributing food and water to the population. With their return, there are currently only Marines from the Netherlands in St. Maarten. Members of the armed forces and the joint support ship “Karel Doorman” continue to support the island with its reconstruction. They are expected to remain on-island until early November.